Grain Weight : 300 Gr. 20 Hornady® SST-MLTM Low Drag .50 cal. Black Powder Sabots. The only easy-loading Black Powder Sabot on the market that doesn't sacrifice accuracy! With new polymer technology, the Hornady® Low-Drag Sabot packs a lethal punch with superior construction that separates it from the pack. Packs of twenty .50 caliber rounds. 20-Pk. of Hornady SST-ML Low Drag .50 cal. Black Powder Sabots, 300 Grain is rated 4.8 out of 5 by 16. Rated 5 out of 5 by Santa Claus from Great Performance I have used these bullets on deer for the last 5 years ahead of 100 grains of Blackhorn 209 with excellent results. One shot kills every time including 4 deer this year with 2 different shooters.. Rated 5 out of 5 by Shurshot from Accurate, Deadly, Dependable, You Bet! I have used these the last three years for whitetails out to 150 yds. very accurate in my CVA Accura MR. One inch groups at 100 yds. with 100 grain ( 2 pellets) IMR White Hots or 100 gr. (volume) Blackhorn 209. Try these bullets with the black Hornady sabot if you gun loads extremely easy or accuracy is not what you think it should be. Complete penetration on all six whitetails taken, short and heavy blood trails with quick recovery on all. Rated 5 out of 5 by Metrojoe from Great Price Have been using these for the past four years and taken nice bucks the last three years. Rated 5 out of 5 by Gil505 from Great Product! 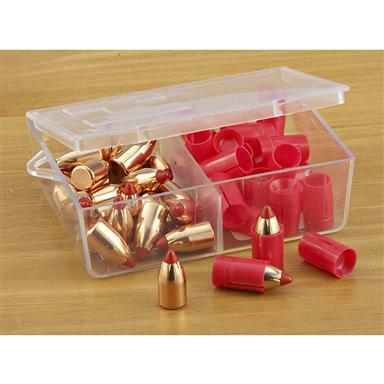 Hornady makes some Great bullets for smokeless or muzzle loading and there not over priced. I recommend them to everyone.. Rated 5 out of 5 by Waynes choice from Great product exciting price These well made great price bullets are also dead on target in more ways than one. Big game black powder action. Grain Weight : 245 Gr.